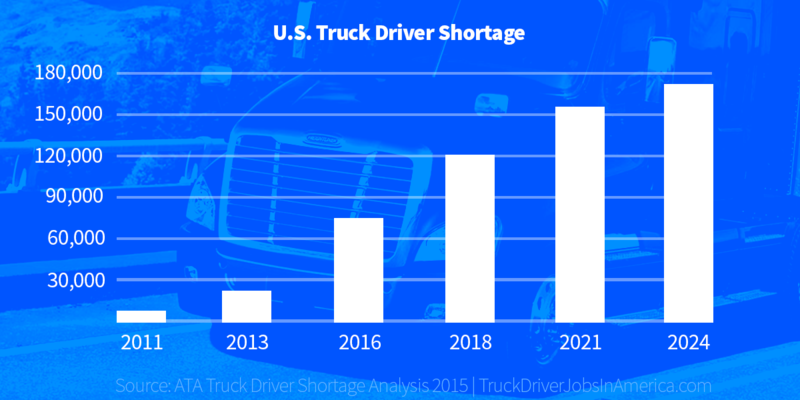 Truck driving jobs are becoming more attractive with recent increases in driver pay and sign on bonuses, less government regulation for young drivers and US Veterans, and more available positions due to a truck driver shortage. Helpful job sites like ours can guide your search for the perfect career fit when comparing hiring requirements, truck driving companies, and pay and benefit packages. There are even hundreds of free CDL schools across the nation. If you are new to the trucking industry, this guide will walk you through the process from understanding what truck driving jobs are like all the way through finding the best job offers out there. After just a few months, you will be ready take your first paying job as one of America’s truck drivers. The trucking industry is the heart of America. Every day, it pumps vital resources across the nation and makes sure that each city can meet its needs to survive and thrive. 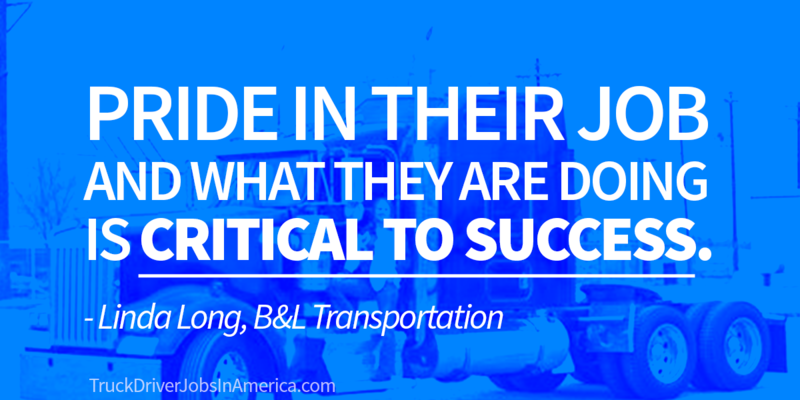 Truck drivers are a powerful part of a successful America. But as Spider Man’s Uncle Ben said, “With great power, comes great responsibility.” The Indiana Motor Truck Association (IMTA) represents one of the largest groups of drivers in the United States. According to IMTA, trucks in Indiana transport 80% of total manufactured tonnage and 80% of Indiana communities depend exclusively on trucks to move their goods. This incredible demand explains why 1 out of every 14 jobs in the state belong to a truck driver. If you are looking for a job that truly makes an impact on the lives of Americans and you want to make good money while you do it, truck driving may be the right career for you. For insight on what the top companies are looking for in a driver recruit, we turned to Linda Long of B&L Transportation, a successful, family-owned refrigerated trucking company with an impressive safety record and a close-knit team of dedicated drivers. Linda shared that pride in your work is the most important factor she sees in successful, high-earning truck drivers. Whether you are a company driver or an owner-operator, “Pride in their job and what they are doing is really critical to success. Some people see it as a paycheck, but we have drivers that really care about the company and what they are doing. They are truly enthused about it, want to be part of the industry and have pride in growing the business.” Most beginning truck drivers take their first jobs as over-the-road (OTR) or long haul drivers that deliver goods across the nation and in between different regions. There is not one simple truck driver job description because each job varies. In most cases, OTR truck drivers are responsible for delivering shipments on time despite obstacles like traffic or weather, which can mean odd sleeping hours plus several days away from home. Newer truck drivers have starting salaries around $60,000, not including sign on bonuses that currently range from $1,500 to $10,000. Experienced drivers that demonstrate a safe driving record and consistent on time deliveries can make around $80,000 per year and team drivers can earn over $100,000 because they are able to drive more miles in a shorter time period. If you fit the above description, then a truck driver job might be a good fit for you. When you’re ready to get started, there are just three steps from here to your first paycheck. 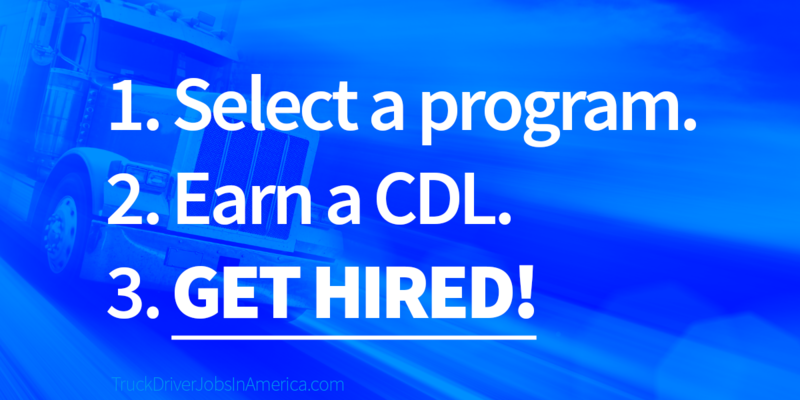 Step 1: Select a CDL training program. One of the fastest and easiest ways to get your CDL is to sign up with a company that offers free CDL school and training! You can apply for a job that offers CDL training with our application. If you decide go to a traditional CDL school, you will need to select a CDL training program or truck driving school that includes the best education and experience possible while charging a fair, manageable rate. Professional truck driving schools teach safety techniques, advanced truck handling like dealing with narrow paths or dangerous road conditions as well as overviews of government regulations, appropriate documentation of hours, miles and income, and important customer service skills. CDL crash courses are available online and around the country, but they do not provide the detailed information that a new interstate driver may need and they do not cover information that self-employed, independent or owner-operator drivers need to know. Many local community colleges offer CDL schools and training at an affordable rate, but they do not guarantee job placement or advanced on-the-road training that some drivers may want. Most new truck drivers will select a professional truck driver training program because they are the most comprehensive and their instructors are selected from the top trainers in the industry. One of the best ways to measure the reputation of a professional truck driving school is by looking at their state examination pass rate as well as their job placement rate. A popular option for many new drivers that want quick job placement after training is to select a company that runs their own training program. These schools provide advanced training while evaluating students as potential company drivers. Vincennes University is a public university in Indiana that offers an extensive truck driver training program. Their Director of Logistics, James Dolan, shared valuable information about what public, non-for-profit programs offer and how these programs different from company training. 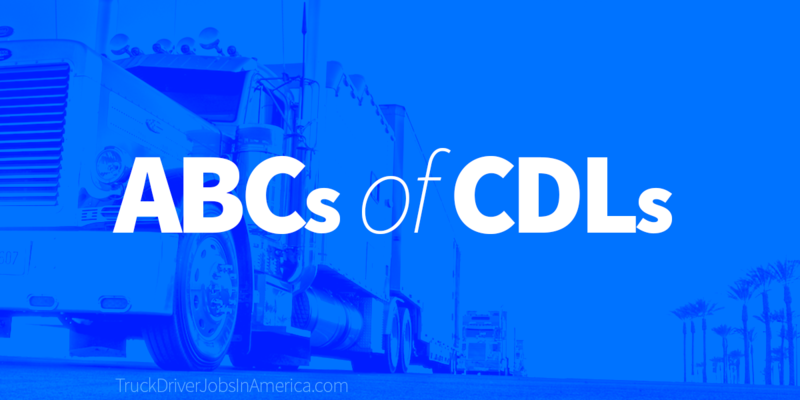 What is the average cost of CDL training? The Vincennes University (VU) program is $3,775 which includes 6-weeks of instruction, materials, equipment usage and state exam attempt. There are other programs listed online between $3,000-$6,000 per student. Programs that offer free training up-front often require 1-2 years of service to the company. Are there outside costs that a potential student should consider, such as textbooks and room and board? If so, what is the range of these additional costs? Room and board is not included in the VU program. Other costs might include $17 permit payable to the Indiana Bureau of Motor Vehicles (BMV), $36 license payable to the Indiana BMV, and $86.50 Hazmat endorsement paid to the US TSA. These fees vary state by state. What are the differences between going to a training program through a public or private school versus being trained directly with a company? Success rates on the state exam of an individual with training are much higher than someone attempting the exam without training. Most of the Indiana-approved training programs are affiliated with a specific carrier. VU is the only non-profit public CDL training program in Indiana. Do most programs offer job placement? Most programs offer placement directly into their partner carrier. VU has agreements with 15-20 nationwide recruiters offering employment options. Students interact with recruiters during the training and are able to select the right employer that meets their specific requirements. How does CDL training through a formal school help prepare a truck driver for their career? Training programs are designed to pass the state exam; trucking schools, such as VU, are designed to develop a safe professional driver. Schooling is offered in lieu of over-the-road experience. Is financial aid available and how should a student find out if they qualify? Yes, but typically only for VU students, not for any other Indiana CDL programs. Vincennes University is a state supported college and can offer CDL training that includes 16 academic credit hours. These credit hours allow students to apply for financial aid, scholarships and state and federal funding. Will a student have the opportunity for on-the-road experience during training? Students will experience both over the road, highway and city driving during training. Students can expect to experience 45 hours of behind-the-wheel time over the course of 6-week training which will include, backing, driving, docking, hooking, delivery and pickup, etc. What are the best tips students should keep in mind when looking for a training program? Look for a program that maximizes behind the wheel time as well as introduces the student to as many employment opportunities as possible (over-the-road, in-town, regional, intermodal, etc.) Students should also ask their training provider what their past student success rates are for obtaining their CDL license. VU CDL can boast a 96% success rate over the past three years in students completing the program and obtaining their Class A CDL. Be sure to research schools thoroughly. Things to consider include tuition plus room and board costs (if applicable in your circumstance), available financial aid and/or borrowing requirements, graduate recruiting process and hiring rate. CAUTION: Be careful if you select a training program that offers licensing for ONLY Class-B or Class-C drivers. These can include minimal endorsements and several restrictions which may significantly impact the number of job opportunities available as well as truck driver salary offers. 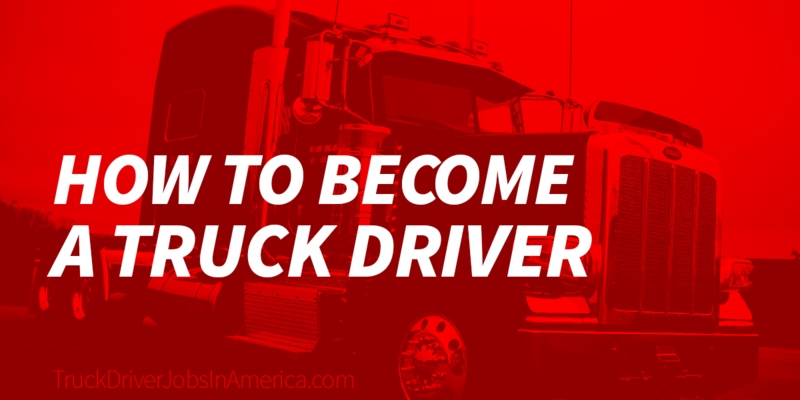 Step 2: Obtain a commercial drivers license. Class A is the most diverse and allows you to drive most tractor-trailer trucks. Class B allows a driver to use most vehicles without a trailer. Class C is the most common driver license. Class C CDLs limit drivers to smaller vehicles. To prepare for your state-licensing exam, make sure you have a copy of your state’s Commercial Driving Handbook so that you can read details explaining everything the examiner will require. If you attend a professional training program, your instructor will help you prepare for the exam and company-sponsored programs will provide a truck for your appointment. Most of these training programs offer more than 200 hours in training over the course of several weeks and many even provide job placement before graduation on the condition that you pass your exams. Success Tips The vehicle that you test in for your licensing will determine the number and type of restrictions placed on your license. You can also obtain special endorsements for hazardous material transport, carrying passengers with you in your truck and advanced safety techniques. Restrictions and endorsements on your license may affect the number of job offers you receive and they may affect your range of salary offers. Step 3: Get hired with the right trucking company. The American Trucking Association estimates that the trucking industry as a whole as employs nearly 9 million people, including positions that do not involve driving like dispatchers and company leadership. Barbara Hunt of the Indiana Motor Truck Association shared with us that the current truck driver shortage is over 47,500 needed drivers nationwide. With such high demand for qualified drivers, applicants seeking new positions have the advantage of being more selective during the hiring process. Source: ATA Truck Driver Shortage Analysis 2015` B&L Transportation’s Linda Long shared insight with us on the important things that a driver should consider when choosing an employment offer. “If family time is important to you, you need to ask how often you will be home and ensure that you and your employer are on the same page. If a job requires something that you don’t want to do, find another opportunity that works better for you. For example, many drivers prefer ‘no touch freight’ jobs but can forget to ask that question during the recruitment process.” Linda also notes that a driver should ask about the kind of communication they will have with their driving manager or dispatcher. “This can be the difference between if you feel successful as a truck driver or if you feel like you’ve chosen the wrong career path.” B&L Transportation dispatchers are a close community that work one on one with their drivers to ensure they have open, honest communication about routes, delivery times, deadlines, weather issues and home time. When it is time to compare job offers, check out job listing sites like ours here at TruckDriverJobsInAmerica.com, which help you identify and compare many different jobs at one time. By entering your information into one application, you can apply for all the jobs that you qualify for with one simple step. Then, recruiters call and email you with different job offers. By finding a job this way, you can make sure that you are able to connect personally with several different companies and choose the right combination of company, culture, pay and benefits that fit what you are looking for. Success Tips As you grow your career, keep in mind that most companies reward safe and loyal drivers with higher salaries and better runs. The better your safety record and the longer you stay with a company, the more likely you are to be sought after by new companies. Find a High Paying Truck Driving Job For tips on how to find a high paying driving job that fits your needs, watch this video from our team at Truck Driver Jobs in America. https://www.youtube.com/watch?v=FTcp0iATNYA By following these tips, you will have options with competitive employment packages and you can choose which driving job offer you like best. Dave Squire is veteran truck driver who has been in the industry for over 35 years. He started as a long haul driver, then worked local jobs and returned back to OTR jobs to travel more. During his time in the industry, he has attended two professional truck driving schools and even worked as a trainer for 2 years. He shared tips with us on how to get ready for truck driving school. o Put your utilities and bills on auto-pay or make arrangements for them to be paid easily and on time with as little involvement from you as possible. This avoids shut-offs, late fees and damage to your credit history while you are away. While you are in training, you will want to focus on your classes because it is incredibly fast-paced environment. o If you have pets, try to find a friend, relative or professional pet sitter to care for your pet. Some cities also have pet hotels with cameras and personal updates on your pets activities. o If no one will be at your home, place a temporary stop or forward for your mail. The US Post Office will keep your mail safe and ensure nothing gets lost while you are unable to receive mail. With these tips, you will have more time to focus on school and less outside distractions to worry about. Beginning a career in the trucking industry takes foresight and planning, but it is a simple process that will prepare you to enter a thriving industry. First, select a CDL training program that will give you all the tools you need to be a successful truck driver. Second, obtain your CDL by visiting the DMV and completing all state-set requirements. Finally, spend time finding the right trucking company that fits your unique needs as a driver.